The Healthy Homes and Lead Poisoning Prevention Program oversees enforcement of lead regulations in Delaware and monitors compliance of the regulated community, including individuals, firms and training providers. The State of Delaware has become the first state in EPA's Mid-Atlantic Region III to administer and enforce a Lead Renovation, Repair and Painting (RRP) program. Individuals and firms performing lead-based paint activities in the State of Delaware must be certified by the Division of Public Health (DPH). After completing an approved training course and passing any required exams, an individual must submit an Application for Certification to DPH. A certification fee is required and the certification is valid for two years. 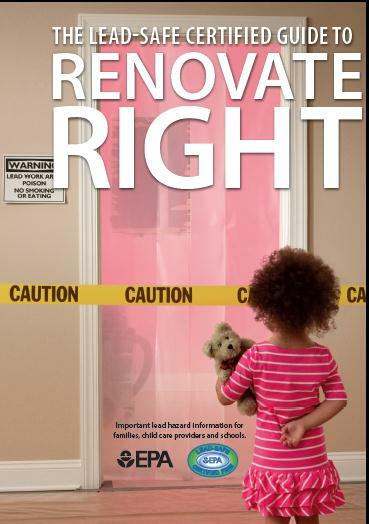 Certification is required for renovations that disturb more than six square feet of painted surfaces in a room for interior projects or more than twenty square feet of painted surfaces for exterior projects or window replacement or demolition in housing, child care facilities and schools built before 1978. Certification is also required for any Lead Abatement activity. Refer to the Application for information about the two-year certification fee. Renovation firms, Renovators and Dust Wipe or Sampling Technicians certified by the Environmental Protection Agency (EPA) at the time Delaware became authorized (March 14, 2014) are certified in Delaware through the expiration date of their current EPA certifications. To perform services after that date, individuals and firms must apply to DPH for recertification. Training Providers must be certified and must apply to the DPH for certification of initial and/or refresher courses in the Lead Abatement and Renovation disciplines. Training Providers also must be approved by the Delaware Department of Education. Training Providers planning to apply for accreditation should contact the Healthy Homes and Lead Poisoning Prevention Program for additional guidance. Individuals must attend training to become certified. Individuals may attend training provided in Delaware or in another state, as long as the training provider is accredited by the EPA or an EPA-authorized State or Tribal program. Training is required for both initial certification and recertification and is effective for two years from the date of completion of the training course. For additional information, refer to the Application and Training Provider links on this page. Homeowners and tenants before starting work. Child care facilities, including day cares, preschools and kindergarten classrooms, and general renovation information to families whose children attend these facilities. Apply to all training providers, firms and individuals for the training and certification of Renovators and Dust Wipe Technicians, and for the accreditation of training providers. All certified firms, individuals and training providers are required to comply with applicable regulations. Use the Tip/Complaint Form to report uncertified contractors, lead-safe work practice violations and other potential violations. Please contact the Lead Program for information about submitting the Tip/Complaint Form. Please note: Some of the files available on this page are in Adobe PDF format which requires Adobe Acrobat Reader. A free copy of Adobe Acrobat Reader can be downloaded directly from Adobe. If you are using an assistive technology unable to read Adobe PDF, please either view the corresponding text only version (if available) or visit Adobe's Accessibility Tools page.